I’ve got a KW w900 with a DDEC3 12.7 in it that decided to throw a rod through the block. I have an older parts truck with a DDEC2 12.7 in it that I am going to replace it with. I don’t care about losing power or anything like that I just need it to run. 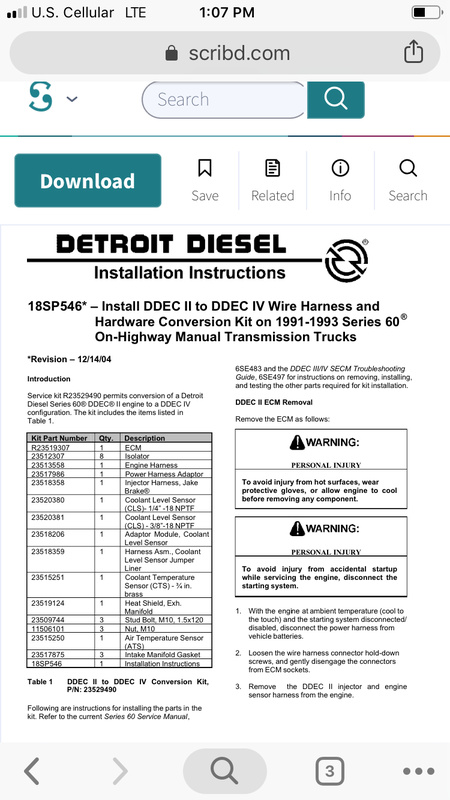 I’ve seen the conversion kit from Detroit to update a DDEC2 truck to 3/4. I’ve got all of the sensors wiring and intake off the blown motor so my only issue is the ecm. Is it possible to have my DDEC3 ecm reflashed to read the different bull gear in the DDEC2, and if so any recommendations on who? If not do I need to buy the ecm from the conversion kit? yes its fairly simple and can be done with programming, the ddec 2 crank has only has 6 pulses. ive done a few of them its a fairly straightforward deal. That's what I figured after doing some reading online, I contacted my local Detroit dealer to see if they could do the programming and was told that they tried it once and it didn't work, and that it was an impossible conversion..... Do you do the programming? Or have any suggestions on who may be able to do it? yes i program, pm me we will sort ya out.